In the cold and wind yesterday, the scouts provided service to some elderly citizens in their community. 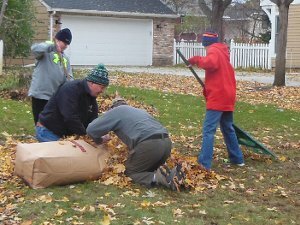 We joined a church's project to rake leaves from the yards of seniors that needed assistance. It was a great excuse to be outside enjoying a fall day before the snow finally arrives. The weekend before, I had the opportunity to participate in a Habitat for Humanity panel build day. Habitat constructs homes for families and have a very good reputation. To make construction go faster, wall panels are constructed in a warehouse and assembled into a house at the site. I did this service as a member of my church, not with scouts. I would HIGHLY recommend every young man take part in any Habitat project he can. If you've never done it, you will be amazed at the skills you learn on a project - for free! I've put up walls, sheetrocked, painted, put on siding, used hacksaws, levels, power saws, palm nailers, t-squares, and the list goes on and on. All the safety stuff that goes with the work is also covered and professional builders provide direction. Look for Habitat opportunities in your community! One hurdle I find with Scouts and Service is the expectation of reward for work provided. When our raking service opportunity was presented to the troop, one scout asked, "Do we get paid?" I thought about that for quite awhile. In our society, nothing's free. You work, you get paid. If someone helps you, you'll owe them a favor later on. This is shown to us often in movies and media. Seldom are we taught to do service for service's sake. Even many philanthropists get tax breaks, names on buildings, or some other reward for contributions. Friends of Scouting even does this - contribute enough and get a coffee mug, or collector coin, or artwork. Remembering all the scouts in this troop have been in Scouting less than 6 months, his question was a good one. Do we get paid? Yes, I believe we do. There is the easy answer of "Yes, you get service hours for advancement." But, I think that is a poor answer that turns the service into a job with a reward. As soon as scouts have enough service hours, they stop serving others. The more meaningful pay is not instant, tangible pay and can be difficult to grasp. My pay from Habitat included learning some skills that are useful the rest of my life. My community will have a new family owning their own home. And, I had fun meeting and working with members of my church. My pay from raking leaves was that I got to meet Jane, a widow living in the same 1937 house since she bought it with her husband in 1962. I got to hear her story of adding an addition and having children grow and leave home. She got to see some Scout uniforms doing a Good Turn rather than trying to sell something, so her view of the BSA might go up a notch and she may share that with her friends. And, I got exercise, fresh air, and time to chat with a couple scouts with nothing else to do. More than all those reasons, doing service just For Service's Sake is really the best reason to do service. When a scout recognizes that his time and effort really helped someone else, while receiving nothing in return, I think that is one big step towards being a Scout. This was a FANTASTIC and well written piece! I have been working with my young Scout to help local homeless youth and the same questions arose, "What do we get?" After explaining that helping others is a reward in and of itself, I obviously had to elaborate as you did here. Thank you for taking the time and effort to write this. I agree, well written. I especially like the feel of it coming from a caring Leader. I need more advise how to handle the "Do I get paid" question. Especially from my Son who just made First Class.